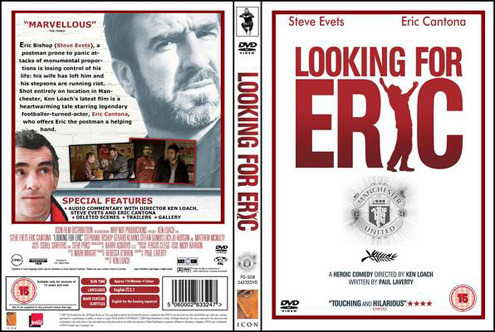 Looking for Eric is an independent Social Realist / Comedy hybrid that is culturally and institutionally British. The narrative is about a middle aged Manchester Postman (Eric) who is frustrated with his life – he has been separated from his ex-wife (Lilly) for 20 years, is single and lives with his two wayward step-sons who cause him significant trouble and distress. One night, at his wits end he steals some weed from one of the boys and sits in front of a full length poster of his idol, French Manchester Utd. footballing icon from the 1990s, Eric Cantona. Stoned he speaks to the poster, asking questions of his hero, after a while he hears a voice behind him - turning round Cantona appears to him in physical form in his bedroom, played by the footballer himself. Throughout the film Cantona ‘teaches’ him to live again and deal with events and problems that are explored in within the narrative through the characters of his step-son, his ex-wife and his daughter who with a baby is just finishing her university degree, and of course through his own insecurities, fears and regrets. It is directed by the British auteur Ken Loach who has been writing and directing independent British films since the 1960s – Cathy Come Home was a late 1960s documentary about homelessness while Sweet Sixteen (2000) was a social realist film about a 16 yr old boy who becomes an alcoholic, runs away from home and ends up in prison. Loach’s film are always gritty in content, often set in the industrial north and reflect narrative themes of alienation, frustration, family values, drug addiction and social dysfunction to name a few. His films are often political in content with Loach making observations on the structure of society including notions of institution and social class. He is seen as politically left wing.